Success Story on Backyard Pig Rearing under Farmers FIRST Programme. Marngar and Sarikhusi are two clusters with five villages each (Marngar Cluster: Borgang, Purangang, lalumpam, Borkhatsari, Nalapara- Joigang; Sarikhusi Cluster: Umtham, Nongagang, sarikhusi, Mawtnum, Mawphrew) under Marngar village cluster, Ri- Bhoi District Meghalaya, adopted by ICAR Research Complex for NEH Region, Umiam, Meghalaya under Farmer’s FIRST Project. The clusters comprises of tribal population whose main source of income is Agriculture. Almost 38 % of the population of these cluster is illiterate and almost 95% of the population is unemployed. In this regard, pig rearing is one of the most important livelihood resources for the people in this region. Pigs, additionally can be considered as a store of wealth and can provide liquid money during financial crisis faced by farmers. Most of the people of north eastern region are non-vegetarian but the supply of meat to this region is less in comparison to demand. Hence, there is a huge opportunity to generate income through pig farming particularly for young and unemployed youth of this region. Most of the farmers in these region rear local pigs and are habitual with traditional management practices (feeding, breeding and health care) which results in small litter size, lower growth rate and economic loss and low production. 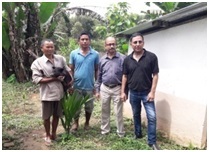 ICAR Research Complex for NEH Region, Umiam, Meghalaya introduced improved Breed of pigs (Hampshire X Local Khasi), in nine adopted villages (Nalapara, Lalumpam, Purangang, Nongagang, Borgang, Umtham, Borkhatsari, Sarikhusi, Mawtnum) under Farmer’s FIRST Project for rearing as backyard pig farming. A total of 71 farmer beneficiaries and 105 nos. of piglets were distributed to the farmers, to improve pig production in the region. Scientific interventions in the form of training and capacity building for improved housing, feeding, breeding and health care management practices were provided. Technology of Artificial Insemination in pigs developed by Animal Production Division of ICAR Research Complex for NEH Region has been introduced in Farmers FIRST villages. Mr. Mrinal Sohkhwai (32 years old) is an unemployed youth and a progressive farmer residing in Borkhatsari village, under Marngar cluster. He mainly grows crops like paddy, vegetables, spice crop (turmeric, ginger, blackpepper) etc. 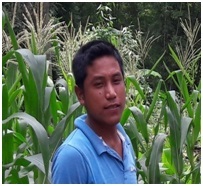 His family depends on agriculture as a source of income. As animal husbandry practices, he used to rear local pigs for fattening purpose, but these local pigs have less body weight and he sells them at a very low price @ Rs. 8000- 9000/ pig, after rearing of more than one year. Mr. Mrinal Sohkhwai received a total of 8 (4 male, 4 female) numbers of improved breeds of piglets (Hampshire X Local Khasi) in August 2017 under Farmer’s FIRST Project. The pigs were provided to him for breeding purposes and he improved his local pigsty with a scientific concrete sty suggested by ICAR personnel. Two of his male pigs were castrated for fattening purpose. Monitoring the growth performance of the pigs were done from time to time and mineral mixtures, medicines etc. were also provided to the pigs as per requirements. As a part of health care, deworming of the pigs and vaccination against swine fever disease were also carried out. He usually fed the pigs with locally available vegetables, colocasia leaves, banana pseudo stem, rice bran, wheat bran, kitchen waste and also occasionally purchased commercial feed. After rearing the pigs for a period of one year, one of his sows conceived naturally and gave birth to 9 piglets and three sows were artificially inseminated (AI)in the month of May, 2018 from which 22 piglets were born. After a period of 1 year, his total expenditure comes to Rs75,000/-, he sold two of his male pigs @ Rs 9000.00 each and earned Rs. 18,000.00 after the pigs attained the age of 8 months. 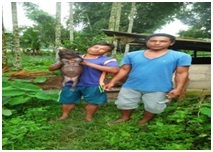 After rearing of another one pig for a period of 1 year he again sold one male pig for Rs. 24,000.00. One of his Female pig gave birth (conceive naturally) to 9 piglets, he sold seven piglets after weaning @ Rs. 2,300/- each and earned Rs. 16,100.00. Three of his female pigs were Artificially Inseminated and a total of 22 piglets were born through AI. He sold seventeen piglets after weaning @ Rs. 2,600/- each and earned a total of Rs. 44,200.00, giving him a total income of Rs 1,02,300/- and a total profit of Rs 27,300/-. One of the aims of the Farmers FIRST programme is maintain sustainable pig farming. In that aspect he is successful by increasing the population of pigs in his pig farm. Not only that for sustainable pig farming in the village, he donated two of his piglets to neighbouring farmers named Biwas Majhong and Duwel Barka. Three sows were Artificially Inseminated and 22 nos. Piglets were born.